The Polynesian Pop craze has lived on best perhaps in the basements, dens and rumpus rooms of tikiphiles across the globe; secret personal paradises, open only to a select few, with service completely unparalleled in the professional world. There are so many home tiki bars out there, I wonder if one could create a vast underground network of tunnels to connect them all — now that would be a bar crawl. Mr. Bali Hai has spotlighted a few of them on the Eye of the Goof, including Scottiki’s Moai Lounge, pictured above. Mr. Bali Hai of course has his own fabulous home tiki bar, Balis’ Hai’daway. My current home tiki bar is sort of a shambles, but you can see pictures of my first home tiki bar, The Humuhumu Room, in Critiki. The Humuhumu Room is gone now, and I cringe now when I look at it and see all the things I would do differently, but it has a special place in my heart — working on the Humuhumu Room is what spurred my interest in tiki. 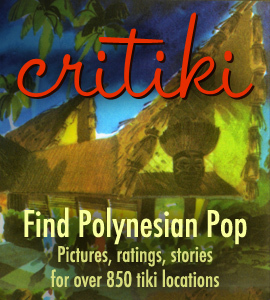 There are several home tiki bars in Critiki — and I’d love to add more! If you have a home tiki bar you’d like added to Critiki, let me know. Thanks for the link, and I’d be incredibly honored to have my little slice o’ paradise added to Critiki, so feel free. I loved the Humuhumu Room, I think it was the first home bar I spotted on the web when I first became interested in tiki (followed by the Pariarts crew’s fabulous lounge). Fortunately for you, you’re in one of the last remaining areas of the world that still has a relative abundance of commercial tiki establishments, so you aren’t complete bereft of tikitude without it. Fantastic, just added Balis’ Hai’deaway to Critiki! It’s true about the local tiki availability — I think that’s the main reason my home tiki bar isn’t as cohesive right now, it’s just too easy to pop out to a local tiki bar. The only downside to Forbidden Island, I guess. And by the way, help yourself to any of the Hai’deaway photographs in my image gallery to illustrate my Critiki entry.